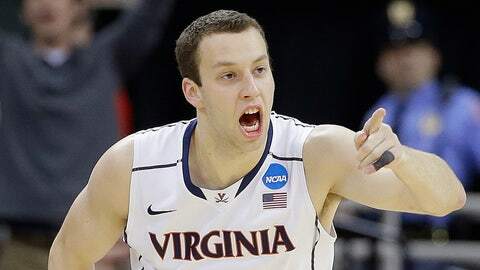 Virginia forward Evan Nolte reacts after a basket against Coastal Carolina during the second half. Virginia spent the first half Friday night flirting with losing in a historic upset and the second half playing the style that carried the Cavaliers to a No. 1 seed in the NCAA tournament. Coach Tony Bennett hopes his team learned enough to keep advancing through the bracket. Anthony Gill scored 17 points to help the Cavaliers pull away late and beat No. 16 seed Coastal Carolina 70-59 in the East Region, earning Virginia’s first NCAA victory since 2007 on a night when nothing came easy until the final minutes. The Cavaliers (29-6) trailed by 10 in the first half and five at halftime to the Chanticleers (21-13) before pushing ahead for good with about 9 minutes left. A No. 16 seed has never beaten a No. 1 since the tournament expanded to 64 teams in 1985, and the Cavs ensured history would wait at least another year. Still, Virginia had to overcome a cold offensive start, a lackluster defensive showing that allowed Coastal Carolina to build confidence, even bickering in the locker room at halftime. "I told them, `Now you have to come together in a way that you haven’t all year because of what’s at stake," Bennett said of his halftime message. "I said, `They’re capable of beating you. Stop being afraid. If you lose, you lose.’ I said, `Play. Play as hard as you can." The second half was a perfect illustration of the formula that helped the Cavaliers win their first Atlantic Coast Conference tournament title since 1976 and the program’s first No. 1 seed since the days of Ralph Sampson. Virginia shot 65 percent (13 for 20) after halftime — including 6 for 10 from 3-point range — while holding Coastal Carolina to just 32 percent (8 for 25). "I don’t know if they thought it would come easier than it did, or if they were a little nervous," Bennett said. "I’m not sure. I really am not. I don’t know what goes on inside their minds. But I knew we needed to settle ourselves, become more composed but more tenacious in the same way. "You wouldn’t want to end your season like that, especially how they’ve played and what they’ve done up to this point." Evan Nolte came off the bench and hit two huge 3-pointers to help Virginia finally push away from the Big South champion Chanticleers, who were in the tournament for the first time in 21 years. The game was tied at 47 before Nolte’s 3s powered a 23-7 spurt that finally put the game away. Virginia advanced to Sunday’s third round to face No. 8 seed Memphis. Malcolm Brogdon scored 10 of his 14 points after halftime, while freshman London Perrantes added 12 points and six assists with no turnovers. The Cavaliers got some of their biggest contributions from the bench. Gill followed his big three-game run through the ACC tournament by going 7 for 10 from the field to lead Virginia. Meanwhile, Nolte — a 6-foot-8 sophomore who had barely played in recent games — came off the bench after Akil Mitchell picked up his third foul at the 8:53 mark and knocked down the two 3s that helped Virginia push ahead 56-48. He hadn’t attempted a shot Friday night before burying those two 3s. "I don’t think I was the secret weapon," Nolte said, "but it felt really good to come out there and just try to give a spark and just shoot with confidence." Badou Diagne scored 14 points to lead the Chanticleers. Warren Gillis added 13 in the program’s first NCAA game since 1993. Coastal Carolina coach Cliff Ellis — who could appreciate Virginia’s run after spending a decade in the ACC as Clemson’s coach from 1984-94 — couldn’t have asked for much more from his team. "We competed," Ellis said. "At the same point in time, we came up short and we’re disappointed we didn’t win. We came in here to do that." Playing on the same court where 14th-seeded Mercer upended Duke earlier Friday, Coastal Carolina threatened to pull off an even bigger upset by shooting 52 percent in the first half to take a 35-30 lead at the break. That made the Chanticleers only the ninth No. 16 seed ever to take a halftime lead on a No. 1 seed, though it’s now happened for three straight years. They just couldn’t finish off the Cavaliers, who went ahead for good on three free throws from Perrantes with 8:34 left followed by Nolte’s 3 that finally gave Virginia a cushion. "It’s real tough to lose," graduate guard Eric Smith said. "We’re proud of our efforts, but at the same time, we really felt like we could have beat them."